Tykes is a social media-born design & lifestyle brand, organically embraced by pro athletes, fans, and celebrities around the world, including Stephen Curry, Kris Bryant, and DJ Khaled. Due to its strong, active social media following, Tykes is often used as a media vehicle by major brands in order to effectively communicate their messaging and product announcements. Tykes designs can currently be seen on best-selling Under Armour apparel, NBA Lab skateboard decks, and Red Bull Snapchat filters. Debuting on Instagram and Twitter, the Stephen Curry "Keep Pounding" design was turned into a one-of-a-kind shirt by Under Armour. The Tykes social media vehicle is utilized on numerous occasions to promote new products such as the DJ Khaled/Jordan Brand sneaker exclusives. A social media partnership with Tykes engaged students to show their team spirit like never before, culminating with an official "Tykes Day" event during a nationally televised game. Social media artwork became a series of official NBA skateboard decks, which were promoted via a social media campaign partnership. 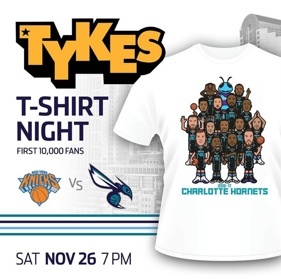 A multi-tiered social campaign partnership between Tykes, NBA, and the Charlotte Hornets built up to an official "Tykes Night," which was the first sold-out game of the season. Red Bull enlisted Tykes to create a series of World Series MVP Kris Bryant Snapchat filters during surprise events in Chicago, becoming some of their most-utilized filters to date.